DuClaw | Beer Apprentice - Craft Beer News, Reviews, Interviews and Info. Hello everyone. For today’s craft beer review I’m going to be trying the DuClaw Retribution produced by the DuClaw Brewing Company located in Bel Air, Maryland. This particular bottle is barrel #2 of 20. I don’t really know the significance of that, but maybe we can check the website, duclaw.com, and see if it has any more information regarding this brew. A full-bodied, Single Barrel Bourbon-aged Imperial Stout with rich aromas of espresso and dark chocolate, and smooth roasted malt flavor. Aged for 6 months inside charred Kentucky white oak bourbon barrels to add the natural vanilla and caramelized sugar flavors of the bourbon soaked wood to the beer. Each bottle run is drawn from a single barrel, making each batch a unique drinking experience. Ok. Well, that helps out a bit. Let’s get it in a glass. This beer came in a 22 oz. bottle and it had an ABV of 9.0%. It poured black!!! The head was nice and tan, but relatively small. The texture was smooth and kind of fizzy. The retention time was ok as was the lacing. The crown was easily regenerated with a few swift swirls. A ton of alcohol legs were left on the sides of the snifter and they were very thick and clingy. The nose presented a very soft aroma of Bourbon. It was rather woody with a solid dose of vanilla though. A decent waft of sweet chocolate too. Roasted and toasted grains provided a very sturdy backbone. Not overly complex for a barrel aged beer, however super well balanced and harmonized. Quite simply a beautiful bouquet I thought. Nothing seemed over the top nor did it try to obliterate my nostrils with extremeness like a lot barrel aged beers do. The taste released some of the smoothest Bourbon flavors around. A sweet vanilla and oak were intermingled very well with toasted bread croutons and roasted grains. Again, a touch of chocolate to add just a slight bit of bitterness and a smidgen more sweetness. Like the aroma, very well balanced and harmonized without being too powerful. The mouthfeel was a solid medium. Smooth and dry. It was a lot softer than I was expecting however. A very pleasing amount of warmth was felt from the back of the throat to the chest and on into the belly. The carbonation was a tad low, but a secure amount of flavor was left on the palate long after the sip. I’ll tell ya. I thought this was a great beer. It really was a well blended and proper barrel aged beer in my humble and novice opinion. It was much easier to drink than some others of this style. It packed plenty of flavor and it left me wanting more after I had finished the bottle. The aroma was outstanding and the flavor was rather nice as well. I would highly recommend you guys trying the DuClaw Retribution if you have the opportunity. I don’t think you will be disappointed with it. It’s probably geared more for the cooler months, although I had no problem at all in finishing the entire bottle on the relatively warm day that I had it. 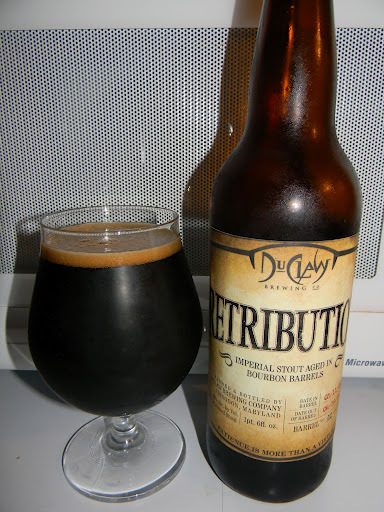 Have any of you beer folks tried the Retribution? What did you think of it? Did you like it as much as I did? Feel free to leave a comment and tell me all about it if you wish. Thanks for checking back in on another review guys. I really appreciate it. Hi guys. For today’s craft beer review I’m going to be trying the Naked Fish brewed by the DuClaw Brewing Company located in Bel Air, Maryland. Big thanks to the Hungry Duo (Adam Hudak and Stephanie Suratos) for sending me this beverage to try. From the website, duclaw.com, we gather this bit of information regarding the Naked Fish. Gourmet chocolate raspberry coffee is used in the brewing process to achieve this unique flavor and aroma. Naked Fish is a dark, medium bodied stout that finishes fairly dry with chocolate and coffee tones. This beer comes in a 22 oz. bottle and it has an ABV of 4.6%. The brew poured a super deep ruby to black color with some brighter ruby highlights around the bottom and edges of the glass. The crown was khaki colored, smooth and creamy. It wasn’t particularly large however, but the retention time seemed adequate and the lacing looked pretty good. The aroma brought forth compelling hints of dark chocolate and some roasted coffee bean. Raspberry tones were easily noticed, but they served as only complimentary fragrances without ever becoming overbearing or too “loud”. Very nice I thought. Some roasted grain and breads follow deeper within the smell to help add a touch more complexity. This bouquet kind of reminded me of those chocolate raspberry candies that come out at Christmas time. Yummy. The raspberry jumped out a bit more in the taste. Still not out of balance or obtrusive though. Just more noticeable. Welcome roasted coffee and dark chocolate smatterings gave it a nice, but subtle sweet taste. The bitterness was of medium strength and little to no tartness was found. Again, a slight breadiness brought up the rear and provided some intricacy. The raspberry seemed to vanish somewhat as the liquid passed across the taste buds, which in turn let some of the other aspects really define the beer. Not bad at all. The mouthfeel was medium to medium/thin bodied. A little lighter than I like my Stouts, but that’s alright. It was very smooth, velvety and slick. It wasn’t quite as dry as I was hoping for either. The carbonation was good and a comfortable amount of flavor was left on the palate after each sip. Man, this would be a killer session beer!!! Super easy to quaff. As far as Stouts go, this beer has to rank near the top for the drinkability factor. Literally, one of the easiest drinking Stouts that I’ve ever had. I really liked the raspberry “twist” with this brew too. It was like a nice little surprise with each sip. Overall though, it wasn’t quite as rich or robust as a traditional Stout. Just an enjoyable and interesting drink. I’d say give the DuClaw Naked Fish a try if you see it. I think you may enjoy it. Thanks for reading and commenting folks. I really appreciate it.